← SaaS Stocks: How Much Punishment is in Store? The SaaSacre Part II: Time for the Rebound? In response to my post, SaaS Stocks: How Much Punishment is in Store, a few of my banker friends have sent me over some charts and data which shine more light on the points I was trying to make about SaaS forward twelve month (FTM) enterprise value (EV) revenue multiples, normal trading ranges, and the apparent “floor” value for this metric. 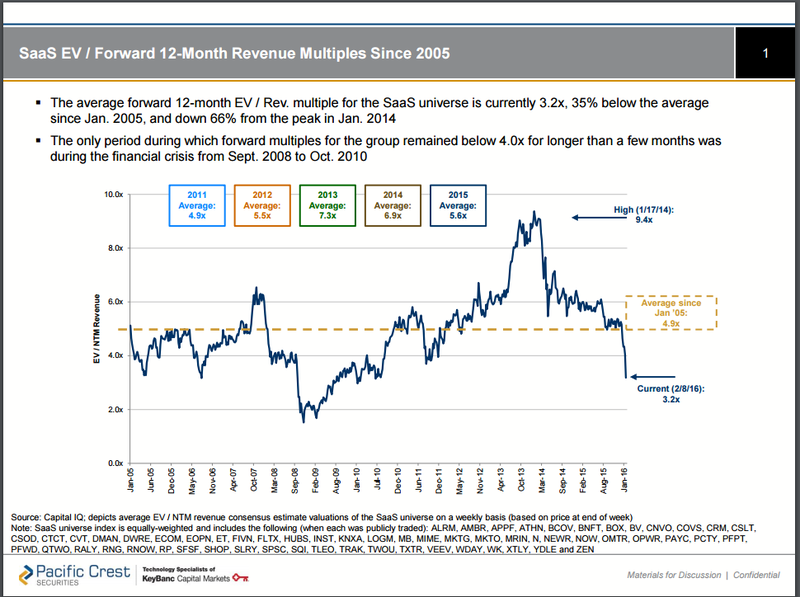 In English, it says that SaaS stocks are trading at an EV/FTM revenue multiple of 3.2, 35% below the average since 2005, and down 66% since the peak in Jan 2014. It also shows the apparent floor at around 2.0x, which they dipped below only once in the past decade during the crisis of 2008. This is not to say that Wall Street doesn’t over-correct, that a new floor value could not be established, or that cuts in revenue forecasts due to macroeconomics couldn’t cause significant valuation drops at a constant, in-range EV/FTM ratio. It is to say that, given historical norms, if you believe in reversion to the mean and that FTM revenue forecasts will not be materially reduced, that we are in “buying opportunity” territory. The question is then which sentiment will win out in the market. Fear of a potential 30% drop before hitting the floor value, breaking through the floor value, or cuts in FTM revenue forecasts. Greed and the opportunity to get a nearly 50% return in a simple reversion to the mean. My quick guess is more fear short-term, followed by some healthy greed winning out after that. Might we see a temporary dead cat bounce before a further sell-off? Maybe. Should we remember the Wall Street maxim about catching falling knives? Yes. But at the same time remember that mixed in among the inflated, private, unicorn wreckage, that we have some high-quality, public, recurring-revenue companies trading at what’s starting to approach decades-low multiples. At some point, that will become a real opportunity. See my FAQ for disclaimers and more background information. I am not a financial analyst and I do not make stock recommendations. I am simply a CEO sharing his experience and opinion which, as my wife will happily attest, is often incorrect.